The Red Planet is getting a whole lot of attention from Earthlings right now, and it’s like never before in the history of humanity and space exploration. Currently, an armada of five spacecraft from Earth are actively exploring the vicinity of Mars, including a trio of orbiters and a duo of rovers. All but one of those space probes is from NASA. The lone exception being the Mars Express (MEX) orbiter from ESA, the European Space Agency. And later this Fall, two additional probes – NASA’s MAVEN and India’s Mars Orbiter Mission (MOM) – will blast off to embark on long interplanetary voyages in search of new Martian discoveries beginning late in 2014. Joining MEX, NASA has two orbiters and two surface rovers plying the Martian skies and plains. Circling overhead are Mars Odyssey (MO) and Mars Reconnaissance Orbiter (MRO). Trundling below are the Martian sister rovers, Opportunity and Curiosity. The spacecraft literally form an invasion fleet embarked on a coordinated attack plan that’s directed by an elite group of highly talented engineering and science ‘Generals’ so as to reap every last drop of scientific research possible – and for as long as possible. Every one of these unique spacecraft is a ‘priceless asset’ as Prof. Steve Squyres, Opportunity’s Principal Investigator of Cornell University, or lead scientist, is fond of saying. Besides conducting breathtaking science in their own right, the MO, MRO and MEX orbiters relay and transmit virtually all of the gorgeous photos and unprecedented research data collected on the ground by NASA’s Curiosity and Opportunity rovers back to huge dish antenna receiving stations spread across Earth. So let’s briefly review the history, goals and results of the current quintet of our Martian fleet and learn what’s new and upcoming in the near term. NASA’s Mars Odyssey orbiter sets a new record for longevity with each passing day and has worked longer at the Red Planet than any other spacecraft in human history. It was launched on April 7, 2001 atop a Delta II rocket from Cape Canaveral Air Force Station, Florida. After an interplanetary journey of hundreds of millions of miles, it arrived at Mars way back on Oct. 24, 2001 and fired its main engine to brake the crafts speed and allow it to be captured by Mars and enter a highly elliptical orbit. The previous Martian record holder was the Mars Global Surveyor (MGS) orbiter which operated in orbit from Sept. 11, 1997 to Nov. 2, 2006 until contact was lost following a computer glitch. A technique known as aerobraking was used over the next three months to fly Odyssey through the upper atmosphere of Mars and utilize drag to gradually lower the crafts altitude and eventually enter its science mapping orbit. Odyssey has made numerous high impact scientific discoveries along the way since science operations began in February 2002. Within a few months, Odyssey made the key discovery of the entire mission when it found that the polar regions harbored substantial caches of water ice within a meter of the dry surface of Mars. The detection of water – in the form of hydrogen — from orbit using the crafts Gamma Ray Spectrometer led directly to the proposal for the Phoenix mission which confirmed the discovery in 2008. Phoenix landed directly on top of vast sheets of frozen water ice in the northern polar region of Mars and scooped up samples of ice for analysis by the landers science suite. Odyssey also relayed most of the science data from Spirit, Opportunity and Phoenix and is continuing that task for the new rover Curiosity. • MARIE (Mars Radiation Environment Experiment), for studying the radiation environment. 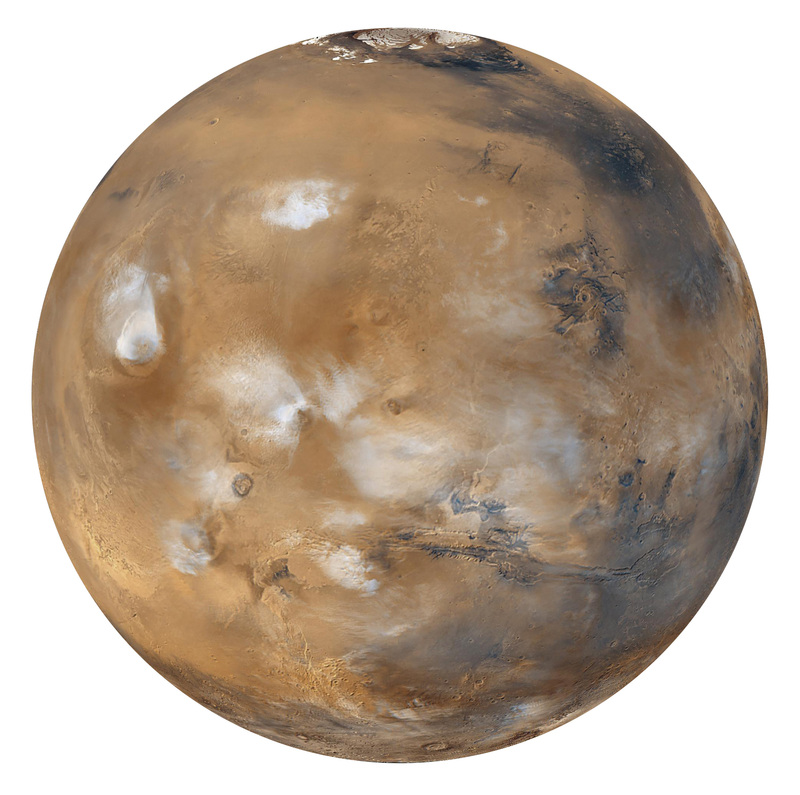 Odyssey completed a survey of the radiation environment to determine the radiation-related risk to any future human explorers who may one day go to Mars and globally mapped the amount and distribution of many chemical elements and minerals that make up the Martian surface. Such data helps explain how the planet’s landforms developed over time, provides clues to the geological and climatic history of Mars, informs about the potential for finding past or present life and where are the best locations to search for life and send future landers. Nearly a decade ago, NASA’s pair of identical twin sister rovers – christened Spirit & Opportunity- bounced to daunting airbag-cushioned landings on opposite sides of the Red Planet for what was supposed to be merely 90 day missions, or maybe a little bit longer scientists hoped. They were launched by Delta II boosters a few weeks apart from the Florida Space Coast during the summer of 2003. Today, Opportunity celebrates a truly unfathomable achievement, approaching Year 10 on Mars since she rolled to a bumpy stop on January 24, 2004 inside tiny Eagle crater. Spirit continued roving and exploring for over six years until she unexpectedly died in a hidden sand trap. And as of late summer 2013, Opportunity had just arrived at the base of the first Martian mountain she will ever climb – named Solander Point. Heretofore, the robot has visited numerous craters big and small. Craters offer a window into the past history of Mars. 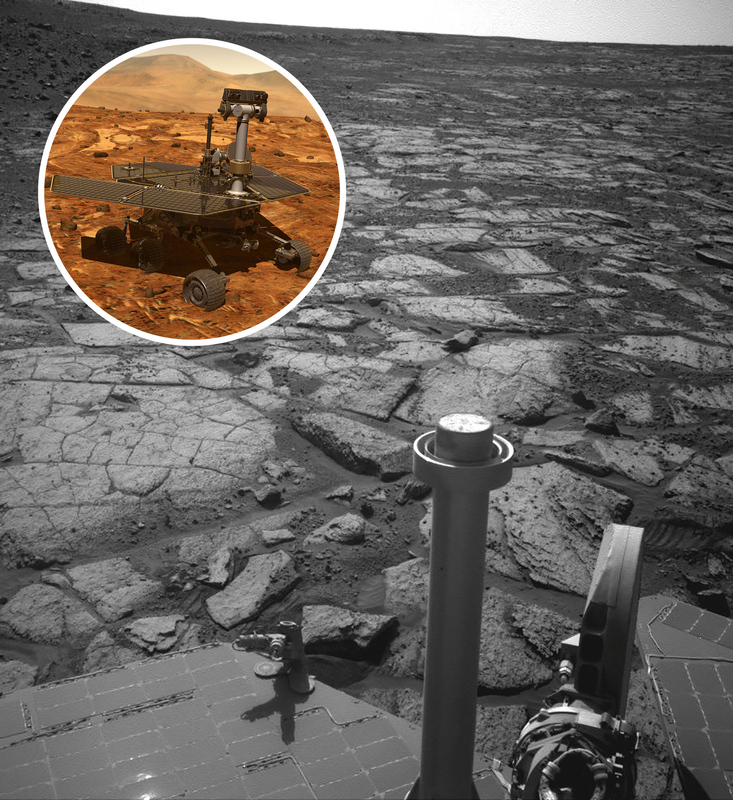 After investigating the mountains base, Opportunity will eventually scale Solander in search of the chemical ingredients that could sustain Martian microbes. It’s expected to be a super sweet spot for science, potentially loaded with clays and hydrated mineral veins and making the most remarkable findings yet about the planets watery past – thus building upon a long string of previously unthinkable discoveries due to her totally unforeseen longevity. “Regarding achieving nine years, I never thought we’d achieve nine months!” Principal Investigator Prof. Steve Squyres of Cornell University told RocketSTEM. As of November 2013, Opportunity has surpassed 3480 Sols, or Martian days on the surface. She is now 119 months into the 3 month primary mission – that’s 39 times beyond the 90 day “warranty.” With her 6th ultra frigid Martian winter approaching, the golf cart sized rover remains healthy, has snapped over 185,000 images and driven over 23 miles. The resilient, solar powered Opportunity robot is roving around beautiful Martian terrain that is remarkably Earth-like and where life sustaining liquid water once flowed billions of years ago. Opportunity is currently located at the western rim of huge Endeavour crater where she made landfall in August 2011. 14 mile (22 km) wide Endeavour Crater features terrain with older rocks than previously inspected and unlike anything studied before. Since then she spent most of her time investigating a low rise along the eroded rim named Cape York, where she discovered phyllosilicate clay minerals on Mars for the first time in history. At Cape York, the rover investigated “Esperance” rock during Spring 2013. It was loaded with clay minerals that form in neutral water – more conducive to life – that ranks as one of the “Top 5 discoveries of the mission” according to Squyres. Opportunity is now investigating the foothills of Solander before ascending the north facing slopes by year’s end to soak up the sun for the life giving solar arrays during the six month long Antarctic-like winter. 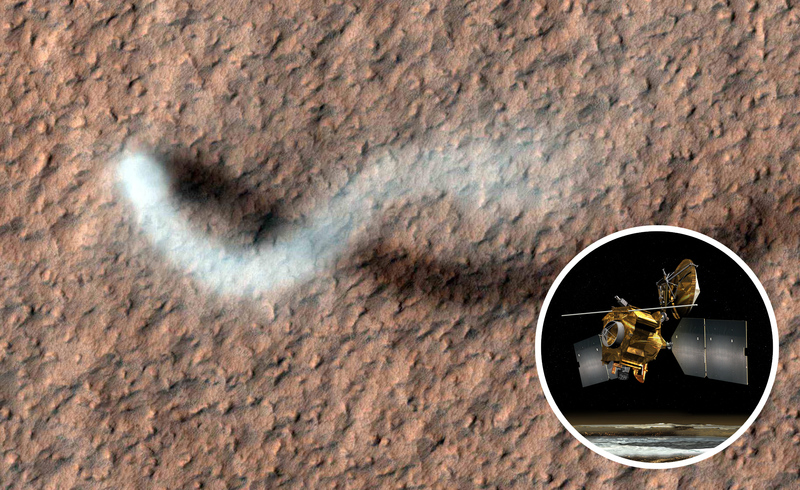 MRO is NASA’s biggest and most powerful orbiter circling Mars. It was launched on August 12, 2005 atop an Atlas V rocket from Florida, and achieved orbit over seven years ago on March 10, 2006. Like its smaller cousin Mars Odyssey, it used several months of aerobraking maneuvers to attain its final science orbit to preserve precious fuel and extend the mission lifetime. MRO is equipped with six science instruments, including the HiRISE high resolution camera and two others, the CRISM mineral mapping spectrometer and the SHARAD subsurface radar hunting for signatures of water and internal geological structures. The torrent of spectral data and tens of thousands of imagery from MRO has completely revolutionized our understanding of the Red Planet. HiRISE is the largest diameter telescope ever sent on a mission to deep space. It’s like having a spy camera at Mars and sports a resolution of about 1 foot from an altitude of about 200 miles. Besides science, the high resolution HiRISE camera was used to hunt for safe landing sites for all the recent rovers and landers over the past seven years. And CRISM was a significant aid as well in selecting the most scientifically compelling landing sites based on the spectral data searching for clues to water and minerals that could support Mars life. And after the rovers safely touched down, the HiRISE images are also used in real time to track and direct the robots along safe and swift driving paths with the best science return and also avoid potentially deadly quagmires, as much as possible. HiRISE is so powerful that it even captured the iconic images of Phoenix and Curiosity during their parachute assisted descents to the surface. Recently, NASA approved the use of CRISM to capture special new high resolution spectral scans of minerals that are absolutely crucial for directing the long lived Opportunity rover’s hunt for signatures of habitability atop the intriguing mountain named Solander that she will soon ascend. New CRISM observations centered over Solander Point were acquired during August 2013, according to Ray Arvidson, who is the mission’s deputy principal scientific investigator from Washington University in St. Louis, Mo. 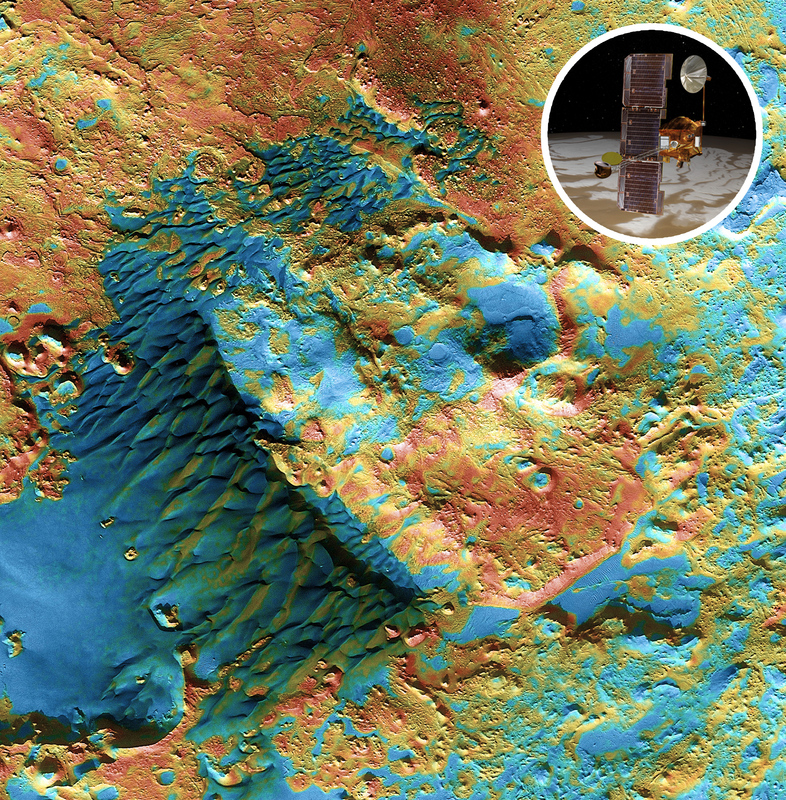 The Mars Express spacecraft is Europe’s first mission to the Red Planet. It was launched on June 2, 2003 atop a Russian Soyuz rocket from the Baikonur Cosmodrome in Kazakhstan and attained orbit on December 25, just prior to the arrivals of Spirit and Opportunity. The probe has worked magnificently ever since. It is equipped with eight science instruments from a variety of European nations. The High Resolution Stereo Camera (HRSC) from Germany has provided thousands of fabulous color images from all over Mars with a two meter resolution. The Visible and Infrared Mineralogical Mapping Spectrometer (OMEGA) spectrometer from France discovered deposits of phyllosilicate clay minerals from orbit. The Sub-Surface Sounding Radar Altimeter (MARSIS) from Italy discovered subsurface water and complements the SHARAD radar instrument on MRO. NASA’s mega Mars rover Curiosity is celebrating 1 Year on the Red Planet since the dramatic, nail biting touchdown on Aug. 6, 2012 by reveling in a string of groundbreaking science discoveries demonstrating that Mars could once have supported past life – thereby accomplishing her primary science goal – and with a promise that the best is yet to come! “We now know Mars offered favorable conditions for microbial life billions of years ago,” said the mission’s project scientist, John Grotzinger of the California Institute of Technology in Pasadena, CA. “Curiosity has landed in an ancient river or lake bed on Mars,” Jim Green, Director of NASA’s Planetary Science Division, told RocketSTEM. As 2013 comes to a close, the six wheeled robot is now speeding onwards towards Mount Sharp, the huge 3.4 mile (5. 5 km) high mountain dominating the center of her Gale Crater landing site – and which is the primary destination of the mission. 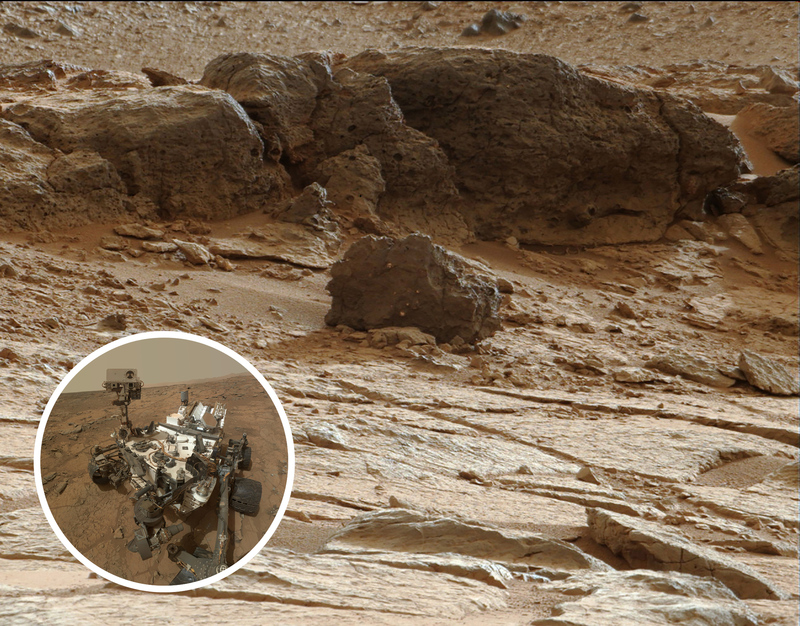 During Year 1, Curiosity has transmitted over 190 gigabits of data, captured more than 71,000 images, fired over 75,000 laser shots to investigate the composition of rocks and soil and drilled into two rocks for sample analysis by the pair of state-of-the-art miniaturized chemistry labs housed in her belly – SAM and CheMin. Mount Sharp still lies roughly 4 miles (6 kilometers) distant – as the Martian crow flies – and the rover should arrive there sometime in the Spring of 2014 if all goes well. “We hope those enticing layers at Mount Sharp will preserve a broad diversity of other environmental conditions that could have affected habitability.” says Grotzinger. Read more about Curiosity’s adventures in the January 2013 and April 2013 issues of RocketSTEM, as well as in future issues. MAVEN (Mars Atmosphere and Volatile EvolutioN Mission) is NASA’s next mission to Mars and scheduled to lift off on Nov. 18, 2013 from Cape Canaveral, Florida. Read complete details about MAVEN in this story. MOM counts as India’s first ever mission to Mars. It is due to blastoff on India’s Polar Satellite Launch Vehicle (PSLV) from Srihanikota, India during a launch window that runs from Nov. 5 to Nov. 19. The orbiter is a technology demonstrator equipped with cameras and atmospheric spectrometers. NASA is providing communications and navigation support through the Deep Space Network (DSN). Read complete details about MOM in the story starting on page 20. The nations of Earth plan even more exciting missions to Mars later this decade, We’ll describe them in a future issue of RocketSTEM. Next post How long before we get there?